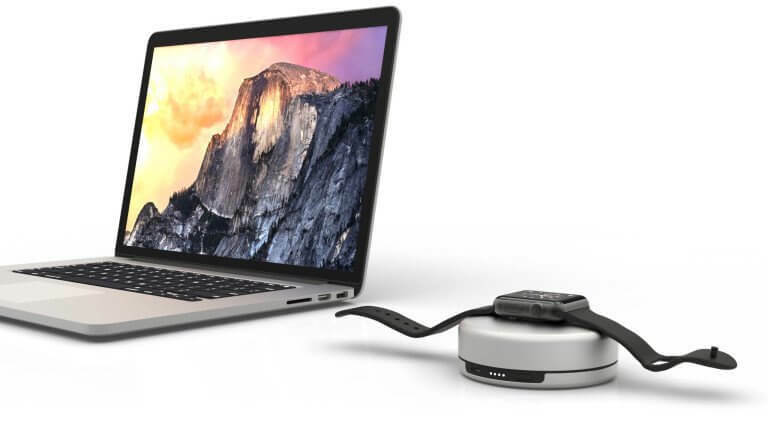 Looking for a mobile charging solution for Apple Watch wearers constantly on the go? We take a look at the charging Pod by NOMAD. Soon after purchasing my Apple Watch, I found that battery life on the go was a major problem. I normal day’s use for me is roughly 50-60% battery, which isn’t a problem if you can throw it on the charger each night. However, if you’re making a quick overnight trip, you now have to pack an extra charger, which doesn’t help at all if you’re on the move. On more than one occasion I found myself having to swap chargers out in my car while driving to alternate charging my iPhone and Apple watch. While not quite a catastrophe, it can be rather inconvenient. Insert the NOMAD Pod ($49.95), a really elegantly styled charging dock with built in 1800 mAh battery. First of all, it solves a really simple problem of charging your watch on a regular basis. Adding this docking station to your nightstand is a stylish way to untangle the bland six foot charging cable that comes standard with the Apple Watch. That alone adds a lot of value to this reasonably priced product. From there, the value goes up. While setup was a tad unclear, you just plug your Apple charging cable inside of the Pod casing, and twist it around placing the charging connector into the top space. The external power connector is now a standard USB port, which now makes charging on the go much more universal. That is, if you need to recharge your Pod. With the 1800 mAh battery, you will easily get several days of full charges to your Apple Watch. Simply by throwing the Pod into your briefcase or overnight bag, you now have a phenomenal amount of charging power at your fingertips for road use, airports, or outdoor events. (Camping or hiking would be prohibitive without this mobile charging source, which allows for great fitness tracking and other app uses). Recently during a Winter storm power outage, the battery power came in very handy. By unplugging the Apple Watch charger, I was able to then charge my iPhone and iPad with the Pod’s built in battery. Adding the NOMAD Pod to your emergency supplies makes this product just even more practical than first imagined. For the online price of $49.95, it’s a very reasonably priced addition for Apple Watch wearers on the go. A stylish dock, mobile charging, emergency power device is worth every penny.